Gladys Hulette was born July 21, 1896, in Arcade, NY. Her mother was an opera star, and by the age of three she was acting on the stage. Some of her stage appearances in the early 1900's include"Sappho and Phaon," "Romeo and Juliet," "The Smoke Fairy," "Blue Bird," and "Little Women." From 1908 to 1915 she was working regularly for Edison, during a time when it was beneath a stage actress' dignity to appear in motion pictures. 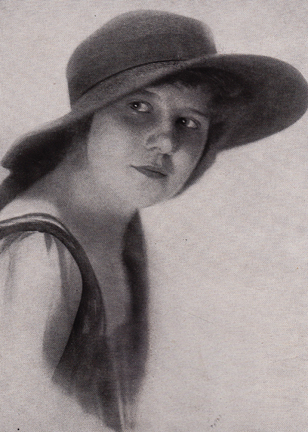 In the late teens, she worked for Thanhouse and then some forgettable companies such as Astra and Gibralter before getting her most famouse role as Esther Hatburn opposite Richard Barthelmess in the hit "Tol'able David" (1921). She continued to be in demand during the twenties making over 30 more pictures after "Tol'able David." After 1928 and the advent of sound, she disappeared from the screen returning in 1933 to make two pictures and two more in 1934. She has uncredited roles in three of these four movies. Hulette had married her producer's son, William Parke, Jr., in 1917, but they divorced in 1924. She was an accomplished artist and at one time worked as a ticket seller at Radio City Music Hall. She died in Montebello, CA, in 1991 at age 95.